The Blackburn Creeklands consists of three reserves linked along Gardiners Creek in central Blackburn. Looking at our wonderful Blackburn Creeklands park today, it is difficult to imagine a situation only thirty years ago which could have resulted in our parks being largely isolated with housing subdivisions in between. This potential disaster was prevented through the “Up the Creek!” campaign. This page tells its story. The City of Nunawading purchased Furness Park to preserve native plants in 1941. 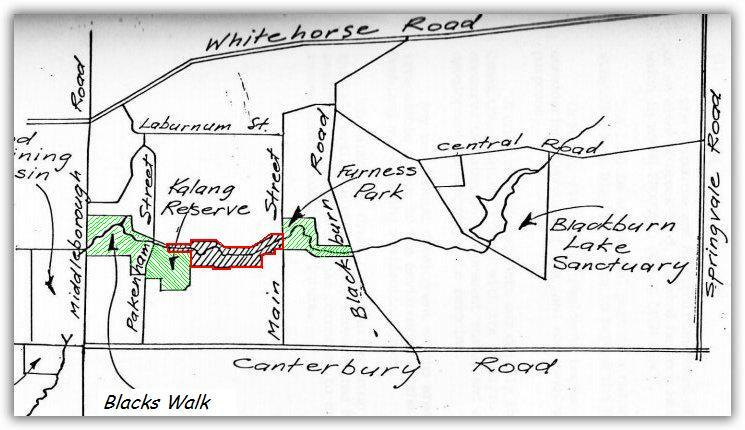 Kalang Reserve* and Black’s Walk were acquired in 1966 and 1967 respectively. Gardiners Creek did link the parks – but via property owned by the Melbourne and Metropolitan Board of Works (MMBW) – the much larger predecessor of today’s Melbourne Water and the smaller water authorities combined. The MMBW was also Melbourne’s planning authority at the time. * Nowadays, the term Kalang Park includes the former MMBW land and the oval (Kalang Reserve). Development of Blackburn and suburbs further east burgeoned in the late 1950s and 1960s. We should note that as land is cleared, subdivided with roads, footpaths and houses constructed, the land becomes less permeable and vegetation takes up less water – with the result more drainage reaches the creek systems considerably increasing flows. 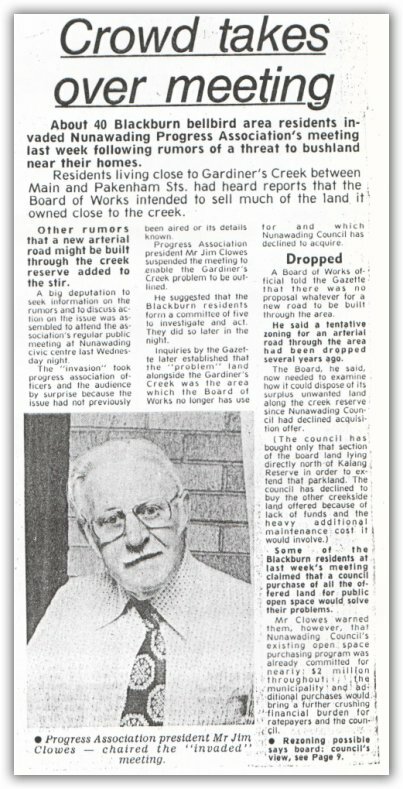 The MMBW acquired land compulsorily along the creek from the mid 1950s to 1973 because it was prone to flooding and also because there was a plan to extend Albion Road along the creek to join up with Heath Street – thereby linking Middleborough and Blackburn Roads. Prior to then, the land was privately owned and used for agricultural purposes such as orchards (a remnant historic pear orchard of about six pear trees still remains at the bottom of Malcolm Street!). Incidentally, other parts of the park also have interesting prior uses – a jonquil farm in part of Furness Park, a poultry farm in the Kalang Oval area and horse agistment in Blacks Walk. The barreling of the creek between Main Street and Laurel Grove was performed in the 1950s and other flood control works were also performed in that period. Plans for the proposed road were dropped. The land was then rezoned as Proposed Public Open Space and Stream and Floodway Zone in 1976. The land was leased out by the MMBW for horse agistment with numerous fences constructed both north and south of the creek. Residents of that era recall that horses would occasionally escape and canter down local streets! In 1979, the MMBW offered to sell the land along the creek to the west of Laurel Grove to the then City of Nunawading (now part of Whitehorse City Council) which unfortunately notified the MMBW on 14/2/1980 that it was only interested in purchasing the land abutting Kalang Reserve (on its northern boundary). At the time, the MMBW believed it had no right to retain surplus land and Government policy required its disposal. The local community was largely unaware of these developments. The campaign to preserve the land for the park started in early 1981 when one of the owners of neighbouring land rang the MMBW to request permission to pick blackberries for jam (and presumably to ensure the plants had not been sprayed). As part of that conversation, the MMBW’s representative mentioned that the land was to be rezoned and sold off for housing development. That neighbour then raised the alarm with other neighbours and the wider community – so the campaign to save the Creeklands was sparked. Blackburn Creek Conservation Group (BCCG) dedicated to the specific cause was taken and the BCCG first met on 12th April, 1981. 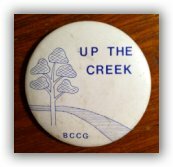 That group, whose catch cry was “Up the Creek!” (featured on badges and t-shirts for the whole family of course), undertook a vigorous campaign involving councillors, politicians, community mailboxing, a major public meeting, working bees and collaboration with the Blackburn Tree Preservation Society. One veteran of the campaign describes the relationship between the MMBW and Council being such that the Board very wisely wanted residents to force council to think again. A key means of communicating the case for conservation and proposed plans for the future was production of the document Land Under Threat – The Future use of Public Space Adjoining Blackburn Creek (caution: large file – 11MB) in November, 1981. Following very successful community action over the period 1981-1983, the then Nunawading Council voted unanimously on 9/5/1983 to acquire land from the Board of Works which enabled Blacks Walk, Kalang Park and Furness Park to be linked along Gardiners Creek forming today’s Blackburn Creeklands. The BCCG was the forerunner of today’s Blackburn Creeklands Advisory Committee. Several key players involved in the original community action are still actively involved. We, of today’s community, owe them, their former and current colleagues a huge debt for the gift of their time, expertise, passion and effort in preserving, nurturing and enhancing such an enjoyable park. We should also acknowledge the essential contributions and expertise of council staff, management and contractors toward the same ends. Newspaper clippings and other documents (Megan and Peter Short). This 1987 scanned monograph written by former Malcolm Street resident, teacher and historian Mr Os Green also has references to the Creeklands campaign.